an if you have a pool? It’s time to book your closing! Click here to book your pool closing with Total Tech! Drain the water to a proper level. Remove all deck equipment. 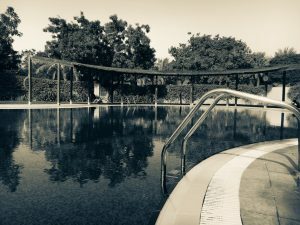 Keep in mind that slides and diving boards don’t necessarily need to be removed over the winter, though that can be done if specially requested. Winterize all equipment, including plumbing. At Total Tech, our pool closings also come with a Freeze Protection Guarantee – keeping your pool protected no matter how cold the winter gets! A partial pool closing is the same as a full closing except that you need to pump the pool yourself, getting the water level down to just below the return jets. Partial pool closings also come with our Freeze Protection Guarantee. Blowing out underground plumbing lines. Winterizing lights, skimmers, and plugging lines. Click here to learn more about our pool closing services and book today! At Total Tech, our pool service technicians provide a full range of pool closing services including for homeowners in Oakville, Burlington, and surrounding communities. Contact us to book your pool closing today!